A stunning, recently refurbished four bedroom apartment in Embassy House , benefiting from parking space. It is featured a beautiful, light and spacious four bedroom high floor apartment, Amazing living room with big balcony, Contemporary eat-in kitchen, Master bedroom with bespoke en suite bathroom, Additional good size bedroom, Restored wood floor throughout.Please contact our consultant for availability. 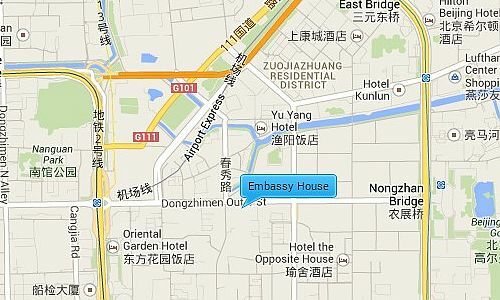 Embassy House is situated on Dongzhimen between the 2nd and 3rd East Ring Road giving it easy access to many of Beijing’s places of interest and the International Airport via its new Airport expressway train line. It is also next to Beijing’s second Embassy area which contains the Canadian, German and Australian Embassies, as well as being next to the Sanlitun area popular with foreigners for its shopping malls, restaurants, hospitals & clinics, theaters, and nightlife.